The SFBBM awards grants to its members who are up to date with their membership fees. 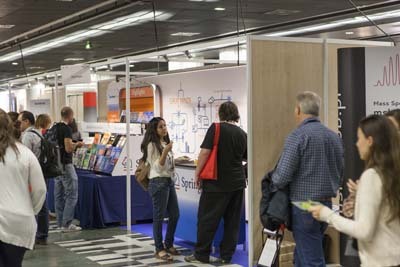 They allow PhD students, post-docs, researchers, lecturers and engineers to participate in conferences with topics related to Biochemistry and Molecular Biology.These scholarships contribute to the reimbursement of expenses that correspond to the participation in a congress (registration, transportation, accommodation and catering). The amount of a grant is: 200 € for a congress in France, 400 € for a congress in Europe or similar countries (Algeria, Israel, Morocco, Tunisia, Turkey, ...) and 900 € for a congress in North America , Latin America, Asia, ...The grants are awarded after receipt of the certificate of attendance at the conference and a certificate on the honor of the recipient stating that the amount of the grant is exclusively dedicated to reimburse expenses related to the convention. Note that the director and the manager of the Unit will be informed by the SFBBM of the award of the grant and the amount thereof. The grants fall into two main categories: those reserved for candidates under 36 years of age and those reserved for candidates over 35 years of age. The age taken into account is that of the candidate on the first day of the congress. They are intended for young researchers to help them attend an international congress abroad. Candidates must be in the third or fourth year of the thesis or have passed their thesis one or two years before their application. The invitation and the application form are sent twice a year by e-mail to all members of the SFBBM. These travel grants are intended for PhD students and post-docs to enable them to attend either FEBS Congresses (in France or abroad) or FEBS Advanced Courses organized in France. The SFBBM gives travel grants to PhD students to help them attend a national or international congress in France. The call ftakes place in the period preceding the holding of a congress organized or supported by the SFBBM members. They are intended for candidates over 35 years old to help them attend an international congress (in France or abroad). The call for tenders, accompanied by the application form (put here a link to download it), is sent twice a year by e-mail to all members of the SFBBM.